Where can I see my password in my WiFi router? Maybe you’ve simply forgotten your Wi-Fi password — maybe a technician from your internet provider or a tech-savvy family member set everything up, and you never knew the password to begin with. Fortunately, recovering your Wi-Fi network password is a simple task, no matter what your level of computer expertise may be. The basic process works the same, no matter what kind of internet service or equipment you’re using, but you will need to know what kind of router you have, as the details vary. The router is the second box, the one not directly connected to the wall for cable, DSL, or satellite. It may have an antenna or two, but not necessarily. Lucky you. Grab it and look for an administrative IP, configuration IP, something like that — it will be a number starting with 192.168. Then look up the default username and password. On a lot of routers, the default will be to leave the user name blank and type admin for the password. You need the brand name and model number — usually the brand name is enough, but we’re being thorough so we don’t have to backtrack later. This will be printed somewhere on the router — just poke around a bit, flip it over — it’s there somewhere. Once you have that information, go to your favorite search engine (sites like Google, Bing, Yahoo, etc.) 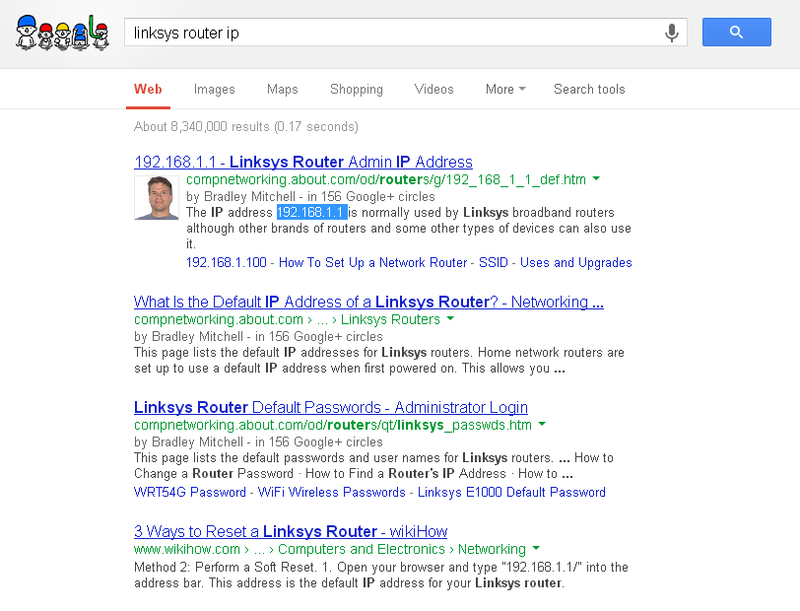 and search for “[Your Router Brand Name Here] router ip”. One of the first few results should give you the number you need — it will start with 192.168. Next, go back to your search engine and search for “[Your Router Brand Name Here] default password”. Again, one of the first few results will have your answer. Most routers use a blank as the default user name and admin as the default password, or admin for both. All right — you have the IP address and default log-in information. Go to the address bar in your web browser (where you normally type in www.google.com or whatever) and type that number. You will get a prompt asking for a user name and password. Type in (or leave blank) the defaults you looked up before. Now you’ll find yourself on a special site inside your router. If not, you’ll need to call whoever set up your router and find out what they set the log-in name and password to OR reset it by going to the router itself, finding the tiny ‘reset’ button, and holding it down for 30 seconds. Wait a bit after that, then repeat the first part of this step. You’ll need to do a bit of poking around now, but don’t feel overwhelmed. You’re looking for wireless security settings — this might be under wireless, Wi-Fi, WAN, or security, depending on your particular router. 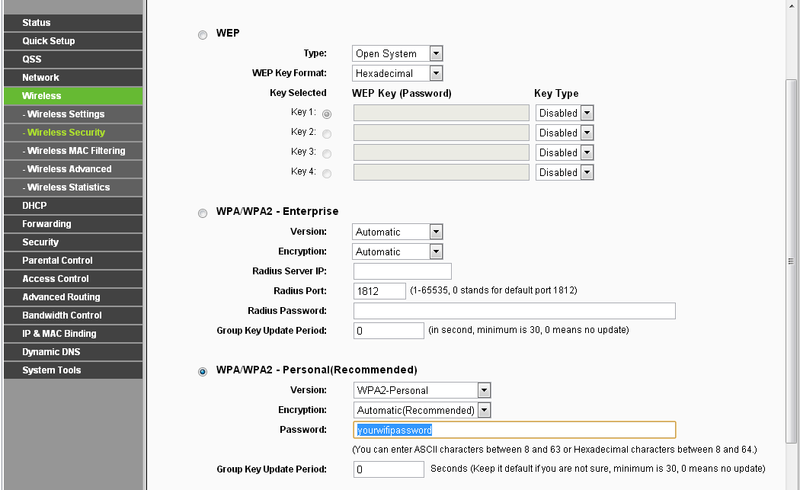 You’re in the right place when the page has things like “WPA” and “WEP” and the like. Your password will be written somewhere here. It might be a big long number, or it might be a word, or a mix of letters and numbers. If all else fails, you can always call your internet service provider — you’ll be on hold a long time, but they’ll help you out eventually.